As we head into cooler weather, amplifying your moisturizing routine is important. Unfortunately, I am not a person who likes to slather on body lotion before bed. YUCK! Traditional moisturizers leave me feeling like I have a coated layer on top of my skin. I’ve tested enough body lotion in my lifetime to know that no matter the brand, the lotion just does not absorb fast enough for me and that yuck-factor happens even with the most expensive of moisturizers. 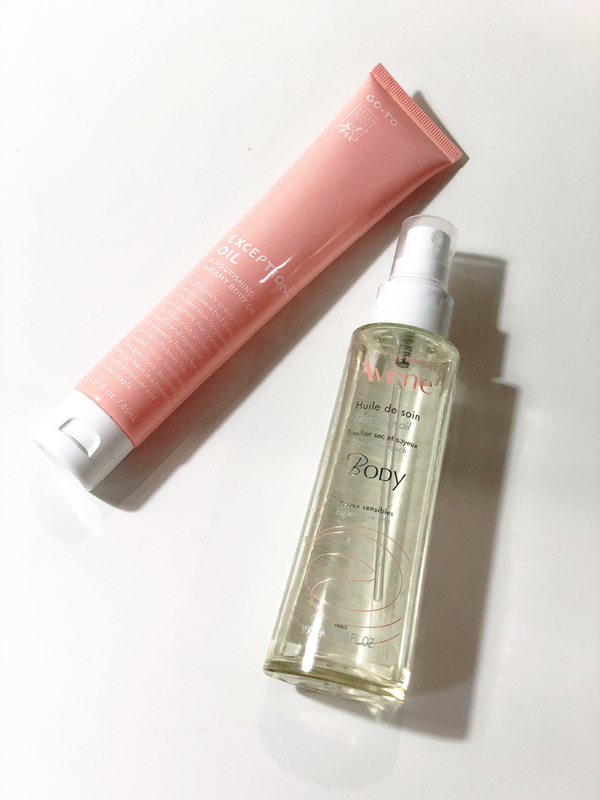 In my hunt for a non-lotion product to keep my skin nourished, I stumbled across two hero oils: Go-To Skincare Exceptionoil and Avène Skin Care Oil. Exceptionoil is a do-it-all, do-it-oil that nourishes, soothes and conditions the skin, nails, heels, cuticles and hair. Saturated with 100% natural oils and butters, including certified Monoi de Tahiti, this product soothes, replenishes, protects against moisture loss, and helps the elasticity and vitality of the skin. In addition to the healing properties, Exceptionoil smells like a dream and quickly absorbs when properly used. The only drawback to this product is the lid, which expels far more product that necessary for a single use so be careful when pouring! Right next to my Exceptionoil on the shelf is Avène Skin Care Oil, which merges pleasure-in-use with nourishing efficacy to enhance your skin’s beauty in a moment of tranquility. The oil has a quick absorbing, silky smooth texture that is rich in essential fatty acids that nourish and enhance your skin’s beauty. In addition to body application, the oil can be used for massages and to give your hair a shine-boost! Bring on the cool weather and comforting oils!